The Los Angeles Dodgers visit Nationals Park on Sunday, September 17, 2017 to play the Washington Nationals. The probable starters are Hyun-Jin Ryu for the Dodgers and Stephen Strasburg for the Nationals. The opening line for this matchup has Los Angeles at +134 and Washington at -144. The Dodgers have a 62-75-10 over/under record and a 73-74-0 run line mark. The Nationals are 71-76-0 against the run line and have a 64-73-10 over/under record. The Dodgers have a 95-52 overall record this season. Starting pitcher Hyun-Jin Ryu has a 5-7 record with an earned run average of 3.59 and a WHIP of 1.34. He has 109 strikeouts over his 117.2 innings pitched and he's given up 116 hits. He allows 8.9 hits per 9 innings and he has a FIP of 4.58. The bullpen has an earned run average of 3.29 and they have given up 410 base hits on the year. Teams are hitting .217 against the bullpen and they've struck out 573 hitters and walked 159 batters. As a team, Los Angeles allows 7.6 hits per nine innings while striking out 9.7 batters per nine innings. They are 2nd in the league in team earned run average at 3.38. The Dodgers pitchers collectively have given up 1,113 base hits and 494 earned runs. They have allowed 166 home runs this season, ranking them 27th in the league. Los Angeles as a pitching staff has walked 403 batters and struck out 1,412. They have walked 2.8 men per 9 innings while striking out 9.7 per 9. They have a team WHIP of 1.15 and their FIP as a unit is 3.65. As a team Los Angeles is hitting .250, good for 21st in the league. The Dodgers hold a .437 team slugging percentage and an on-base percentage of .335, which is good for 7th in baseball. They rank 22nd in MLB with 8.4 hits per game. Justin Turner is hitting .325 with an on-base percentage of .416. He has 138 hits this season in 425 at bats with 68 runs batted in. He has a slugging percentage of .539 and an OPS+ of 151. Cody Bellinger is hitting .273 this year and he has an on-base percentage of .357. He has totaled 117 hits and he has driven in 86 men in 429 at bats. His OPS+ is 148 while his slugging percentage is at .604. The Dodgers have 1,233 hits, including 282 doubles and 201 home runs. Los Angeles has walked 589 times so far this season and they have struck out 1,269 times as a unit. They have left 1,042 men on base and have a team OPS of .772. They score 4.78 runs per contest and have scored a total of 703 runs this year. Washington has a 89-58 overall mark this year. With an earned run average of 2.64, Stephen Strasburg has a 13-4 record and a 1.03 WHIP. He has 182 strikeouts over the 156.2 innings he's pitched. He's also given up 120 hits. He allows 6.9 hits per nine innings and his FIP stands at 2.79. The bullpen has an earned run average of 4.56 and they have given up 430 base hits on the year. Teams are hitting .257 against the Nationals bullpen. Their relievers have struck out 396 batters and walked 145 opposing hitters. As a team, Washington allows 8.2 hits per nine innings while striking out 9 batters per nine innings. They are 7th in the league in team earned run average at 3.9. The Nationals pitchers as a team have surrendered 1,195 base knocks and 569 earned runs this season. They have given up 180 home runs this year, which ranks 17th in Major League Baseball. Washington as a staff has walked 444 hitters and struck out 1,316 batters. They give up a walk 3 times per 9 innings while they strike out 9 per 9. Their team WHIP is 1.25 while their FIP as a staff is 4.06. As a team, they are batting .268, good for 3rd in the league. The Nationals hold a .452 team slugging percentage and an on-base percentage of .333, which is good for 10th in baseball. They rank 3rd in MLB with 9.2 hits per contest. Ryan Zimmerman comes into this matchup batting .300 with an OBP of .356. He has 145 hits this year along with 95 RBI in 484 AB's. He maintains a slugging percentage of .552 with an OPS+ of 130. 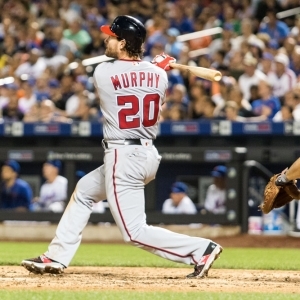 Daniel Murphy is hitting .319 this season and he has an OBP of .381. He has collected 157 hits in 492 at bats while driving in 88 runs. He has an OPS+ of 135 and a slugging percentage of .543. The Nationals as a unit have 1,354 base hits, including 286 doubles and 196 homers. Washington has walked 488 times this year and they have struck out on 1,186 occasions. They have had 995 men left on base and have an OPS of .785. They have scored 5.14 runs per game and totaled 755 runs this season. Who will win tonight's Dodgers/Nationals MLB game against the spread?